This one-player adventure-puzzle (a.k.a. 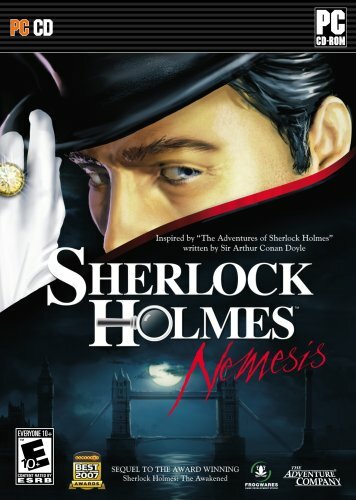 Sherlock Holmes vs. Arsene Lupin – downloadable since November 2007) represents a great challenge in the PC gaming realm mirroring the game‘s plot perfectly. This game requires intelligence (you might want to keep some reference books by your computer), problem solving, and a bit of patience to maximize your entertainment. Set in 19th century England, Sherlock Holmes must sift through countless items and several characters to prevent French thief Arsene Lupin from stealing five British national treasures in as many days. Lupin, a popular character created by Maurice Leblanc, first leaves a letter behind to initiate the challenge with Holmes and the mystery begins. Dr. Watson and an Inspector are along for the ride as well as you comb London searching for clues, people and ways to anticipate Lupin‘s next move. The first person navigation can be difficult at times, but the game improves as you progress. It’s surprising how much planning and content went into this game for the price because you certainly get your money‘s worth. The immense content, maps, scenarios, and variables require a lot of effort to complete tasks that might seem endless at times. The magnifying glass close-up option help you find what you’re looking for as important items mainly appear when you can use them. Unnecessary crouching, a few tedious puzzles and some navigational issues keep this title from hitting the highest marks. Production values like music and voice acting are solid. The graphics incorporate some nice lighting effects, but aren’t extremely deep. The visuals do provide enough appeal when presenting the authentic locations. The replay value remains relatively low since the game developers largely set your path for you. The gauntlet of challenges and the cat-and-mouse tension can frustrate, but if you press past the challenges the reward is good, both for yourself and within the game. You still must find certain items at certain times, which taxes your patience and propensity to default to a walkthrough, but you’ll get satisfaction from completing the game at a steady pace. Younger gamers will find some of the puzzles difficult, but the huge potpourri mix helps with variety. You might find more enjoyment when you slowly progress at your own pace. The extensive use of text matches the mental challenges of the game and also provide a lot of information, which consequently will provide more interest to knowledge-hungry players. The subtitles can help and it wouldn’t hurt to keep a blank pad of paper nearby for notes if you want to progress through the game quicker. A must-have for Sherlock/Lupin fans and an outstanding value for the suggested $19.99 retail price. This entry was posted in Video Game Reviews and tagged Michael Siebenaler, Mike Siebenaler, PC, PC Games, Sherlock Holmes, Tall Writer, video games. Bookmark the permalink.